Divetalking » Artificial Reefs, Conservation, Divetalking, Donation, Earth, Education, extinction, Featured, Lionfish, ocean, Reefs, Reference, Report » Invasive species are harming the ocean – here’s how you can help! With its ornate, flowing fins and bold body pattern, the fish in the picture above is beautiful, but outside of its native Indo-Pacific range, this venomous lionfish can have harmful impacts on marine life. In the western Atlantic and Gulf of Mexico, invasive lionfish are wreaking havoc on habitats, fisheries, and ecosystems with their voracious appetites and rapid reproduction. REEF is leading the way in addressing the lionfish invasion, through a combination of scientific research, lionfish removal projects and derbies, educational workshops, and market development. Your support is crucial to the success of these conservation actions. Please make a donation to REEF today – every contribution this summer will be matched. If you have already contributed, thank you so much for your support! For the past 25 years, REEF has enlisted citizen scientists to collect biodiversity data through the Volunteer Fish Survey Project. Recreational divers and snorkelers who conduct REEF surveys are keen observers of the underwater world and are often the first to report a species that has been seen outside of its native range. Data collected by REEF volunteers is useful in identifying threats to the ocean, including the spread of non-native, or exotic, marine species. Timely reports of non-native species are critical and enable us to work with partners to execute rapid response efforts. As the lionfish invasion has shown, once established, non-native species are challenging to control and may be impossible to eradicate, so we have to act quickly! Please help us continue our work to combat invasive species by making a donation today! Thanks to the generous support of three longtime supporters, all donations received this summer, up to $60,000, are DOUBLED! You can donate securely online at www.REEF.org/donate, mail your donation to REEF at PO Box 370246, Key Largo, FL 33037, or contribute over the phone by calling 305-852-0030. 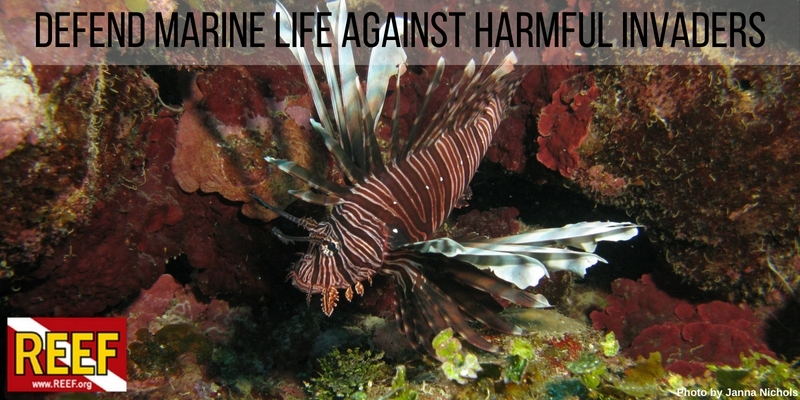 Invasive lionfish are not the only non-native marine species that threatens our oceans. Since 2008, 37 exotic fish species have been documented in Florida waters! This year, REEF has worked with key partners to coordinate two successful rapid response removal efforts, as a proactive way to prevent another detrimental marine invasion. On the west coast of the US, REEF volunteers monitor the presence and spread of three invasive tunicates and have also organized assessment and removal efforts. In California, surveyors also record sightings of an invasive algae. Whether you conduct a survey, report a non-native species, contribute financially to our work, or talk with others about the threats to the ocean, you are an important part of our community of ocean stewards working to advance marine conservation. By making a donation to REEF, you are showing your support for healthy and vibrant oceans. Every gift, no matter how big or small, makes a difference. Please join us in taking action against ocean threats like non-native species.